The articles presented in Gun Studies, offer fresh research and original perspectives on the contentious issue of firearms in public life. Comprising global, interdisciplinary contributions, this volume examines difficult and timely questions through the lens of social practice, marketing and commerce, critical theory, political conflict, public policy, and criminology. In addition to introducing new research, Gun Studies presents reflections by senior scholars on what has been learned over the decades and how gun-related research has influenced public policy and everyday conversations. In the most recent volume of Handbook in Environmental Economics, co-editors Subhrendu K. Pattanayak, Partha Dasgupta, and V. Kerry Smith present chapters by scholars that highlight new advances in the field and present the latest on efforts to review and evaluate new literatures on field and quasi experiments in environmental economics . This book answers key policy questions facing environmental agencies in developed and developing economies and provides the first substantive review of environmental macroeconomics. Media scholarship has responded to a rapidly evolving media environment that challenging existing theories and methods and given rise to new theoretical and methodological approaches. This volume of the Handbooks of Communication Science series presents research on the state of contemporary media, focusing on intellectual foundations, theoretical perspectives, methodological approaches, context, and contemporary issues. Why working-class Americans almost never become politicians, what that means for democracy and what reformers can do about it. Using extensive data on candidates, politicians, party leaders, and voters, Nicholas Carnes debunks popular misconceptions (like the idea that workers are unelectable or unqualified to govern), identifies the factors that keep lower-class Americans off the ballot and out of political institutions, and evaluates a variety of reform proposals. The Cash Ceiling shows that the best hope for combating the oversized political influence of the rich might simply be to help more working-class Americans become politicians. In his new book, Bruce Jentleson profiles 15 transformational political leaders of the 20th century, describing who each leader was as an individual, why they made the choices they did, how they pursued their goals, and what they were and were not able to achieve. 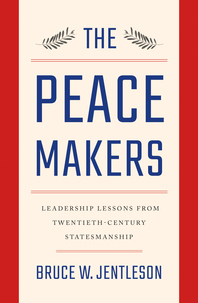 In studying leaders of the past, he draws out lessons across the 21st century global agenda, making clear how difficult peacemaking is, while powerfully demonstrating that it has been possible—and urgently stressing how necessary it is today. Of the 1.2 billion adolescents in the world today, 90% live in low- and middle- income countries. In this new book, Jennifer E. Lansford and Prenerna Banati have collected cutting-edge research articles on adolescent development and the many challenges young people face in these countries. The authors present adolescents not as threats, but as opportunities, contributing to positive discourses around young people today. U.S. women now earn college degrees at higher rates than men. Since the 1960s, they have gained greater economic independence and political power. What explains this? Deondra Rose examines how legislation, such as the Higher Education Act of 1965, drove women’s progress toward equality for the last half-century. We spend a lot of time arguing about how schools might be improved. But we rarely take a step back to ask what we as a society should be looking for from education—what exactly should those who make decisions be trying to achieve? In this book, Ladd—joined by two philosophers and another social scientist—tackle those questions. In this time of rapid globalization, the world's wealthiest nations have found it increasingly difficult to insulate themselves from the residual impacts associated with underdevelopment abroad. Many of the ills associated with, and exacerbated by, underdevelopment cannot be confined within national borders. Sarah Blodgett Bermeo shows how wealthy states have responded to this problem by transforming the very nature of development policy.